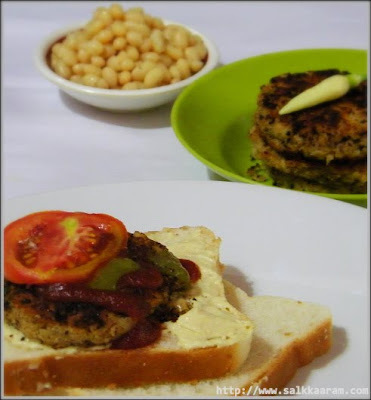 Soybeans Burgers | Simple and Delicious ! Do you have plan to prepare this? You should learn some basics of cooking soya beans. The dried soybeans appears as little bit hard to cook. Pour the contents to a plate and remove all stones or damaged beans. Wash very well and soak the beans in water for overnight. Pressure cook for approximately 1/2 hour on medium heat or until you find them cooked well. Don't add salt while cooking beans since it may increase the cooking time. Keep maida in a shallow pan. chopping in the food-processor will be good. Add cooked beans to this and run the machine to make a coarse mixture. Add coriander leaves, powders and salt to this. Break egg and separate white and yellow parts. Keep egg white in a bowl. Add egg-yolk and broken pieces of bread to the above mashed mixture. Apply little oil on palms, make small balls using this. Dip the ball in egg white, roll over maida. Make burger shapes by pressing slowly using palms. Shallow fry these in hot oil. If you don't like, avoid using egg yolk. This looks delicious! I have never cooked soybeans but the dish looks very tasty! Wow, a healthy burger... Proteinious and I would be glad to have a few more too!!! Seena, haven't been to you blog for a long time. This is a great recipe. Sounds healthy too! Thanks for sharing. 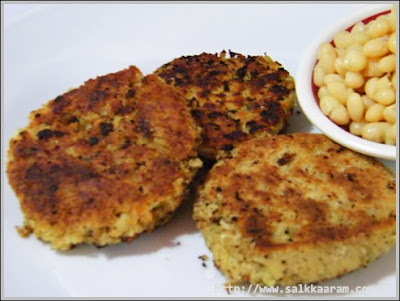 These veggie burgers sound fantastic Seena.